A storm out of the Aleutian Islands is heading our way. The marine forecast for the next couple of days are for gale force winds, combined seas in the 15-20 foot range and rain. As the storm brewed and winds started to pick up, we figured that we better get out and stock up on food and play. Our whitewater paddling buddy Nick joined us for the adventure. A 10 knot southerly breeze had started with some gusting in the 15-20 knot range. The texture on the water was definitely showing the effect of southern winds with occasional whitecaps on the outer waters. 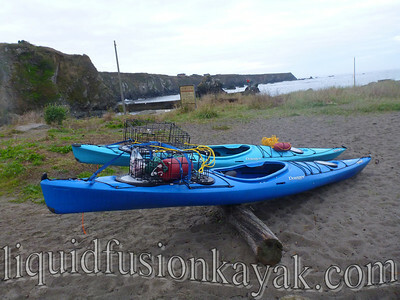 Our plan was to paddle our sea kayaks out of the Noyo Bay, drop our crab pots, play in some rock gardens, abalone dive, and then pull our pots and head for home. Of course, we could have dropped our crab pots in the protected areas of Noyo Bay, but instead had to charge out to where things get interesting. I think that Jeff wants to simulate the drama of Deadliest Catch on our crabbing missions. 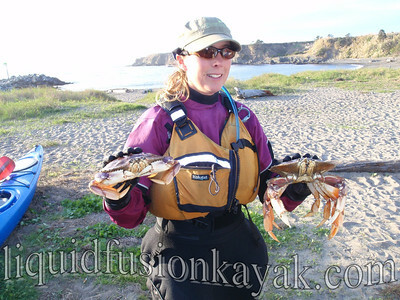 We are definitely getting a lot of towing practice on our sea kayak crabbing adventures. We dropped our pots and off we went in search of adventure and abalone. First we paddled into a favorite spot and had to stop and admire the US Coast Guard plane doing maneuvers out at sea. This is not an everyday occurrence on the Mendocino Coast, and it was fun to watch. The area where we were going to play and dive was really gusty with the southerly winds so we modified plans and tucked into a more protected area. Despite the small swell, Nick and I had some fun rides while Jeff took photos and prepared to dive for abalone. Both Nick and I regretted that we didn't bring our dive gear. Jeff plucked his abs easily but lingered in the water for a bit marveling at the beauty of the vibrant underwater colors of sea life. Eventually the fish got out of the water and we strategized how to pull our crab pots in the windy conditions. I was going to pull the pots as Jeff used a tow to keep me from drifting into the kelp and onto a reef. Nick was going to stabilize my boat and help with strapping the pots onto my boat. I was excited to get to pull the pots and be the first to see our catch of the day. I was a little apprehensive though as the last time we pulled a pot in this area there was a giant octopus on it (feeling crabby). The first pot that I pulled didn't feel heavy so I knew that there wasn't a giant octopus on it. It also didn't feel heavy with crabs. There were 3 crabs in it though. One was a nice sized dungeness crab. Into the cockpit of my boat he went. When we pulled the next pot, I was excited to see 2 crabs. One didn't look right though. He was a beautiful dark red color and had latched his claws onto the bars of the trap. It was a rock crab. It took some finagling to get him to let go and out of the trap. After I got him to let go of the cage, he latched on to my finger. OUCH!!! Fortunately I was wearing my gloves and he didn't break the skin. I got him off and happily sent him on his way back into the drink. Back to shore we paddled - happy that we had 3 abalone, a crab, and a fun day on the water. 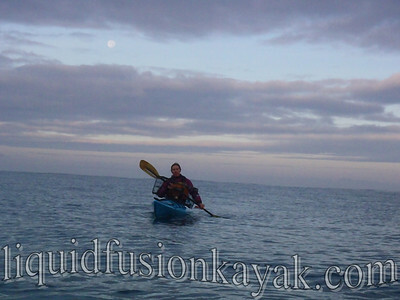 We are working on planning our 2012 calendar and updating the Liquid Fusion Kayaking website. Lots of time on the computer has me feeling a bit crabby so I figured a good cure for crabbiness might be a little kayak crabbing . We decided to put our new Dagger Alchemy sea kayaks to the task. Mostly because they are very stable. We also wanted to get a feel for their outfitting and performance (review of the Dagger Alchemy will be in a future post). 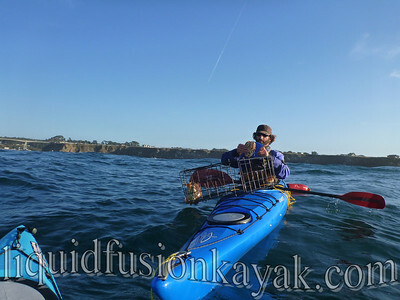 Saturday before our Mushroom Paddle, we paddled out into Noyo Bay and dropped our crab pots. It was a gorgeous morning with calm seas and the full moon setting to the west. Quickly we dropped our pots and headed to the woods to gather mushroom specimens for my mushroom identification and ecology lesson. After the mushroom paddle, we paddled out to pick up our pots. Wind and seas had picked up considerably. Also, quite a few more pots were dropped in the vicinity of ours. I was glad that I had my towline. As Jeff pulled up our pots, the wind and currents were blowing him into the lines of the other crab traps so I had to use an anchor tow to keep him from drifting into harms way. Jeff was stoked as we pulled up the first pot because it was quite heavy. We both envisioned a pot full of tasty Dungeness crabs. As the pot neared the surface, we were dismayed to see a Giant Pacific Octopus wrapped around the top. The tentacles on this guy must have been 5 feet long. It took some coaxing and prodding to get him back into the sea. Obviously, the octopus was as interested in the contents of the trap as we were. Inside the trap were 8 Dungeness crabs. Four of the crabs ended up being too small so we put them back. Jeff stuffed the 4 keepers inside the cockpit of his boat - No, they didn't pinch him. Off to the next pot we went. This pot was heavy too but we were cautiously optimistic about its contents. By darned if there were no crabs in it but 2 large slobs. Slobs is a term that crab fisherman use for Sunflower Starfish which are notorious for getting into pots and devouring crabs. We stowed our pots and happily surfed the swells back to the beach. 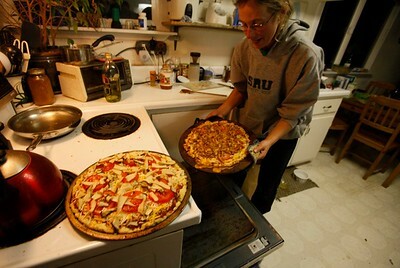 We would be having fresh crab and Chanterelle pizza for dinner. Special thanks to Jimmy Callian for tagging along with us and taking photos (and keeping us laughing). I like the end of daylight savings time in the fall. Of course one of the best features is getting that hour back that we gave up in the spring. Yes, it is dark earlier in the evening but it is also light earlier. Growing up on a farm, my body and mind are programed to maximize the day and are most productive in the morning. Colder weather always seems to come to the Mendocino Coast with the time change. We haven't had a good frost yet but it seems to be impending. We look forward to seeing the salmon travel up the river to spawn and the arrival of our winter migratory birds. Buffleheads are one of our favorites. Shorter days and colder mornings have us spending more time indoors. We have started our winter training regime of cardio, strength and flexibility training. This year, I have realized the need to put more time in on the flexibility end. No, I am not admitting to getting older but realizing the toll that paddling takes on my body. So its time to pump up the pilates ball and throw down the yoga mats for winter cross training. Mountain biking is good for cardio and agility and is down right fun, but targeted agility and strength training. We recently watched this YouTube video of Laird Hamilton's workouts. WOW - I have no illusion of being like Laird but find his workout regime to be inspiring. Shorter days, chilly mornings, also resonate that it is a time to rest and recover. Tom Cat happily helps us with this aspect of winter training. Amanitas, Boletes, Chantrelles . . . Oh MY!!! 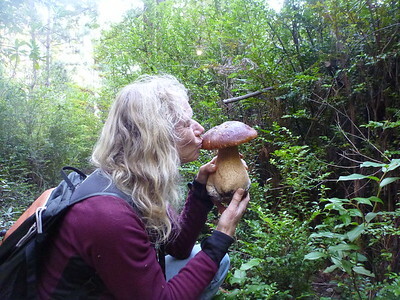 Mushroom season on the Mendocino Coast is in full swing. We've been enjoying the treasures of the forest and sharing them with others. 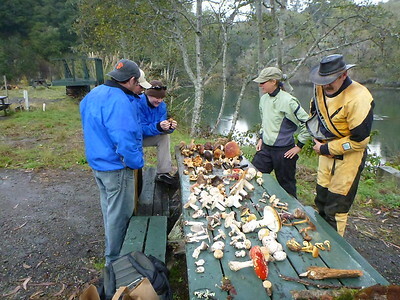 The Mendocino Wine and Mushroom Festival is a fun way to learn about the mushrooms and enjoy culinary delights with our local wild mushrooms. 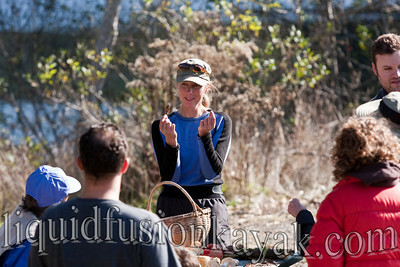 We host Mushroom Paddles to share our love and knowledge of the fruits of the forest with others. The day begins with Jeff and I collecting specimens in the forest. I then present a lesson on mushroom identification and ecology followed by a paddle on the Noyo River enjoying the fall scenery, wildlife and looking for wild mushrooms. 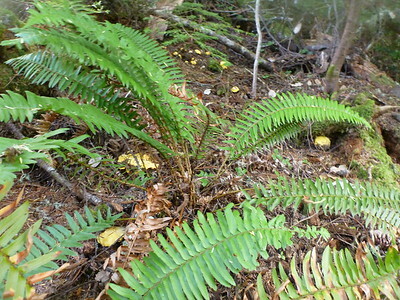 So what have we been finding in the forest? Amanitas are just starting to pop-out. Many are familiar with Amanita muscaria aka fly agaric or Alice and Wonderland mushroom. These beauties add color and beauty to our forest but not to our dinner table. 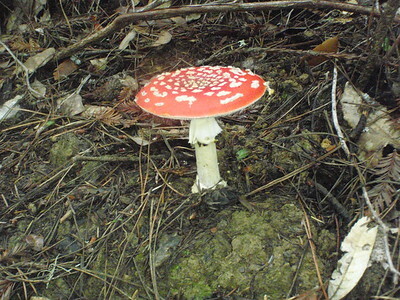 Many species of amanitas are toxic and some are even deadly. 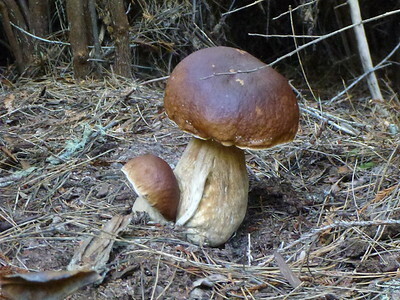 This year we have had a bumper crop of boletes - Kings, Queens, Admirals, and Manzanita. 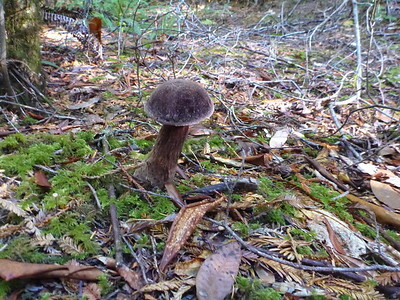 The boletes are my favorite to find in the forest as they are quite stout and they are also my favorite for the table. I feel like a trophy buck hunter when I bag a big-un. I like to dry saute them and eat them as a side dish. On a bountiful year, I will dry them and put them in burgers/soups/stews. This year I have been finding lots of admiral boletes - these ones have lemony flavor and are great with chicken. 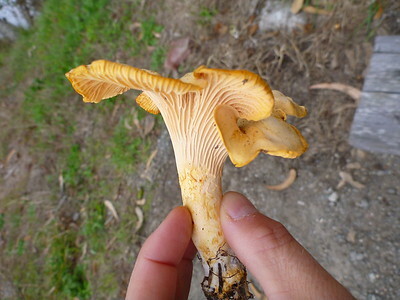 Chantrelles are a favorite choice edible that grows well in our forests. I like to collect them and eat them in just about everything from omelets to pasta and rice dishes and my personal favorite homemade chantrelle pizza. Piacis in Fort Bragg makes a great pie and usually has wild mushroom specials that are scrumptious. PS Candy Caps are just starting to pop out as well. Mushroom ice cream any one? Sounds totally gross even to a mushroom head like me, but it is delicious and my favorite flavor. 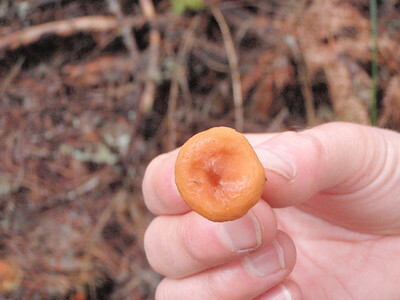 It is made from the Candy Cap mushroom which is a rare form of milky cap that grows prolifically in the forests of the Mendocino Coast. Cowlicks in Fort Bragg makes a delicious ice cream. I use them in pancakes and muffins, but my favorite baked good has been a special recipe that I have developed for Candy Cap Chocolate Chip Bar Cookies.